ONE PATIENT wanted to be able to keep surfing 20 hours a week. Another wanted to return to work and horse riding without restrictions. So both chose new technology to correct their hip problems. Daniel Kay, 42, of Honolulu and Burton Weitzman, 58, of Koloa, Kauai, were among Dr. Hayato Mori's first patients for the Birmingham Hip-Resurfacing procedure. Mori, 41, who has the Center for Advanced Hip and Knee Surgery at Kuakini Medical Center, was the first Hawaii orthopedic surgeon certified to use the new technology, approved last June by the U.S. Food and Drug Administration. The new surgery removes and resurfaces only diseased cartilage instead of removing the entire hip bone, Mori said. "It's for a select population -- young, active people who require a hip replacement," he said, adding that this group comprises only about 5 percent of his patient population. Most of his practice involves total hip replacements on older patients with arthritis, he said. The resurfacing surgery is recommended for physically active men under age 65 and women under age 55, he said. However, women with osteoporosis might not qualify for hip resurfacing because of inadequate bone stock, he said. The $10,000 metal-on-metal resurfacing implant "is not unlike a cap for a tooth," says the manufacturer, Smith and Nephew. 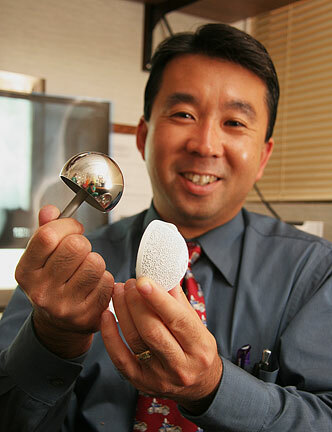 The implant will potentially last longer than metal and plastic implants and allow more strenuous activity, Mori said. "There is a lot of science behind the device to make sure it lasts as long as we think it will last." Kaiser Permanente orthopedic surgeons Mark Shaieb and John Frauens began performing the resurfacing procedure here April 12 after training in England, said Dr. Mark Santi, chief of surgery. Because the technology is so new, Kaiser nationally started a study group to look at it, Santi said. "The key is, What is the long-term result? Is it going to be a good thing, or should we be more restrictive or less restrictive?" He said Kaiser is offering the procedure to younger patients under strict criteria. "We hope, and the theory is, it's going to be better; when a patient needs a revision, there will be more bone to work with." Kay, who works in accounting administration at a real estate firm, said he had a "throbbing pain" in his left hip for more than 10 years from degenerative arthritis. He did some research on hip resurfacing procedure after hearing about it from a nephew and his wife, a physical therapist. "I wanted to return to surfing to the best of my ability, so it seemed like an optimum option." He had the surgery Jan. 8 and returned to work Feb. 14. He had physical therapy to deal with some discomfort, stiffness and weakness and slowly resumed surfing. "Each time, the progression is amazing," he said. "I don't have the pain that I've had for years." But now, he said, "I can really notice the pain on the other side since the pain on the left side is no longer there." He is probably going to schedule surgery on that hip "sooner than later because of what happened here," he said. Weitzman, a Type 2 diabetic whose "bone was dying" in his right hip from avascular necrosis, said, "Orthopedically, I thought it was a great procedure." He had heard about it from Mori, who was at the Kauai Medical Clinic for 7 1/2 years and continues to see patients twice a week at Wilcox Memorial Hospital. Reading about the new surgery, he learned he could recover and return to his activities with few restrictions, he said. That appealed to him because he wanted to go back to his part-time Wal-Mart job mixing paint. An equestrian, he also wanted "to return to being the Sunday cowboy that I have enjoyed for years."